This is probably long overdue, but pet friendly personalized license plates are coming to Idaho. Hopefully. The bill is still awaiting legislation. 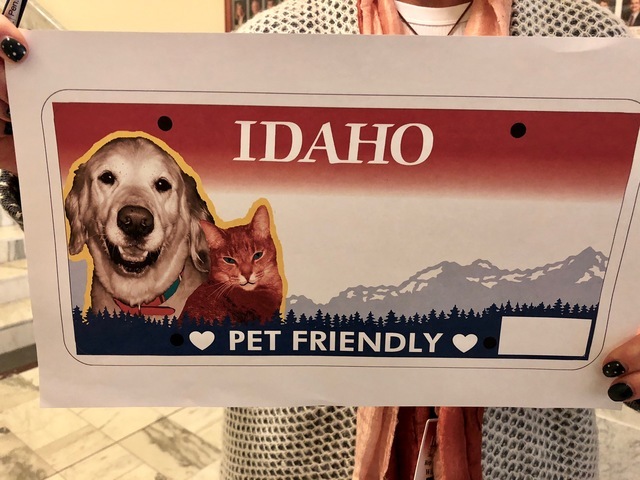 The Idaho Transportation and Defense committee has moved to introduce legislation to the House of Representatives for a pet friendly license plate that would provide funds for spay and neuter services to low income families in Idaho. The house bill number 540, starting on line 33, explains the details of the plate and costs to motorists. Initial plates would be $35 with a yearly $25 afterwards. $13 of each registration would go to the state highway account and $22 would go to the pet lovers fund. The only downside is that the plate is hideous (assuming they use the mock up they've been showing media)! Get rid of the yellow ring around the animals and make it white with a fade and you've got a better plate. I made the one above and personally think it is way better than theirs! BONUS LICENSE PLATE GAME: CAN YOU NAME ALL THESE IDAHO COUNTIES BY THEIR LICENSE PLATES?